Byers buys Bricklin assets after receivership / banckruptcy - End of the line snapshot. Editors notes: The information on this page is taken from Byers own notes. As with the rest of the site, please keep in mind that there could be some errors - especially human errors. 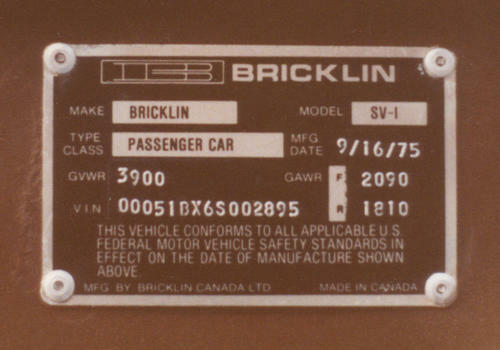 This page lists the Bricklins Byers inventoried at the factory when the he purchased the remaining cars and parts, after the receivership. There are 321 Bricklins listed here. 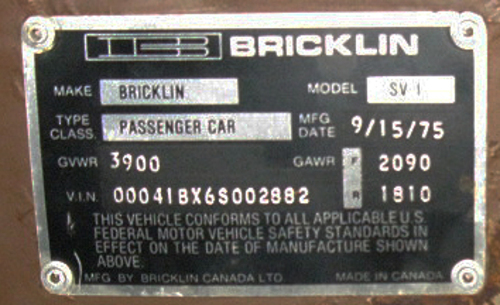 I expected a lot of high number cars, which there are, but was also surprised by the wide number range of VIN's still at the factory on closing - especially when you consider the number of people clamoring to get a Bricklin SV-1 at the time Bricklins were being built. The supply could not keep up with the demand. Most of the cars were Safety Red, Safety White, and Safety Suntan. Some of the cars were sold in Canada, and some were trucked back to Columbus, Ohio for sale. Per a conversation on the telephone years ago, Rich Haines told me that VIN's 2881 and 2882 were not at the factory when Byers went there. Likely VIN 2881 and 2882 were at the factory at the time the plant was seized / bankruptcy, but gone before Byers physically took possession. 2882 was not part of the bankrupt inventory, and was promised to a lottery by Simonds Lions Club, and won by a man by the name of Grey Harrison. This page would not be possible without the help of Rich Haines, and Mike McCluskey. Many thanks to both of these men for making this page possible. Below this point are Bricklins, that at the time of Byers inventory, were on the assembly line, with notes of general degree of completion. 2866... on line. last stage of assembly line. appears ok. minor adjustments. 2867... on line. last stage of assembly line. appears ok. minor adjustments. 2868... on line. last stage of assembly line. appears ok. minor adjustments. 2869... on line. last stage of assembly line. appears ok. minor adjustments. 2871... on assembly line. Engine and entire drive assembly. Body. No doors - no interior - no wheels or tires - no hood. 2898... Byers built from the frame up. 2899... Byers built from the frame up. 2900... Byers built from the frame up. Editors Notes: 2881 and 2882 are shown on this list, because they were on the Byers list of Bricklins on the assembly line. They were not on the inventory list of Byers, and per a conversation with Rich Haines years ago, they were not at the factory when Byers went to the factory. 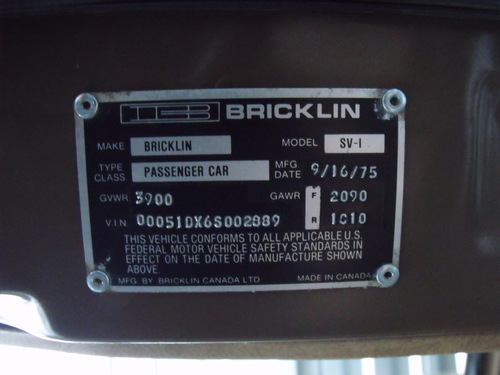 These 2 Bricklins are thought to not have been part of the bankruptcy receivership. Surely, 2881 and 2882 would have stood out on the assembly line, 2881 being Safety Red, and 2882 being Safety White, and the other 30 cars on the line being Safety Suntan. Note that VIN 747 was yellow when being inventoried. Decades ago, I had heard that Bricklin was considering dropping Green and adding Yellow. Speculating, perhaps VIN 747 in addition to being a factory demo car, was perhaps being evaluated for what a Safety Yellow Bricklin would look like.